You are officially starting a new chapter of your life, and there are so many questions popping up in your head that you can barely breathe with excitement! What will the professors be like? Will the exams be difficult? Will you be able to find a part-time job? Or keep up with your fitness routine? How about making new friends in a new city? But one question that is often neglected until too late in the process is finding the best place to stay during your years of university education – after all, it will affect your ability to prep for those exams and hang out in many student-friendly spots downtown! The goal is not to leave this issue on the back burner and help you find the most suitable place to stay as quickly and efficiently as possible, without disturbing any of your other college-prepping goals! 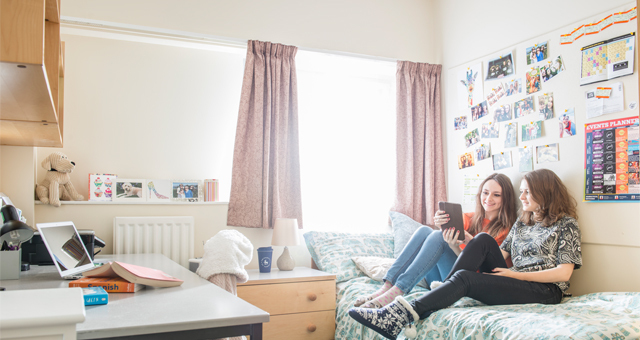 Sharing is caring, or so they say, so why not make the most of your uni experience by checking with other students if they would be happy to share accommodation with you. Whether you’d prefer to love on campus, in an apartment or a dorm, you should make sure that the people who live there share your lifestyle at least to an extent – if someone loves to party and you cannot sleep properly, then this might be a good sign to keep looking for a different roommate. The dream-come-true scenario would be to live with someone you know you can share the space with, such as a friend or a sibling with whom you already have a strong relationship. Others, however, find this option less ideal, if they believe that living together may jeopardize the relationship. So, choose your roomies carefully! The next issue on the list, especially for people who choose to go abroad to the US or Australia to study, is finding something affordable that will allow you a comfortable life without having to worry about making the next rent. Check if the agreement you’re supposed to sign contains any restrictions, and if the rent is acceptable, whether or not you can afford the monthly bills. However, if you have roommates, while this aspect of student life becomes less burdensome, you still need to consider everyone in the budgeting process. Sometimes living with the best people means settling for a less ideal living solution in case some of your roomies cannot afford a pricier place. The neighborhood where you’ll spend your college days also matters to a great extent, as it will determine your access to your university, various amenities in the area, as well as the overall price range and quality of life. In order to find the best student accommodation in Sydney and similar cities with a high standard of living, chatting with locals and checking online for reviews and guidance is the best way to go. Each location comes with a variety of perks and setbacks, so the more you know about a particular part of your city of choice, the easier this decision will be. Talking to students who have already found accommodation in the are you’re looking into may also help you get a glimpse at the local life and make the right choice for you. Some gals like to have access to fast food parlors with affordable bites, some like to be well-connected to the rest of the city, while others prefer being in a quiet neighborhood conducive to long study sessions. Take a moment to think about what your main priorities will be and which region will provide you with the best possible solution. Many students in the US like to live off-campus simply to avoid the crowded, often loud and hectic lifestyle of dormitories, but the former may not be a universal truth wherever you wish to study. Make a list of your priorities, cross-reference with your budget, and make the most of your wish list! Finally, another factor that many ladies forget to consider at all is the level of safety and security in your accommodation of choice. While sharing means that you’ll rarely be completely alone to deal with any possible issues, it’s wise to check if the apartment or dorm include various security perks such as an alarm system, surveillance, or a security guard on the premises. Even details such as a fire alarm and reliable locks on the door can make a difference when it’s time to make the final call and tip in favor of a particular place on your list. Talk to the residents about any security incidents, and always ask for guidance as to which safety basics you should ask for before it’s time to move in!